Whether it’s a Furby or Buzz Lightyear’s button that plays, ‘To infinity and beyond’, most digital audio applications inside toys are actually simple affairs. There’s no Arduino and wave shield, and there’s certainly no Raspi streaming audio from the Internet. No, the audio inside most toys are one or two chip devices capable of storing about a minute or so of audio. [makapuf] built an electronic board game for his kids, and in the process decided to add some digital audio. The result is very similar to what you would find in an actual engineered product, and is simple enough to be replicated by just about anyone. [makapuf]’s game is based on Game of the Goose, only brought into the modern world with electronic talking dice. An ATtiny2313 was chosen for the microcontroller and an AT45D 4 Megabit Flash module provided the storage for 8 bit/8khz audio. The electronic portion of the game has a few functions. The first is calling out numbers, which is done by playing recordings of [makapuf] reading, ‘one’, ‘two’, ‘three’, … ‘twelve’, ‘thir-‘, ‘teen’ and so on. This data is pumped out over a pin on the ATtiny through a small amplifier and into a speaker. After that, the code is a simple matter of keeping track of where the players are on the board, keeping score, and generating randomish numbers. It’s an exceptional exercise in engineering, making a quite complicated game with a bare minimum of parts. [makapuf] estimated he spent under $4 in parts, so if you’re looking to add digital audio to a project on the cheap, we can’t imagine doing better. You can see a video of [makapuf]’s project after the break. Ever wanted to make the jump from microcontrollers to logic chips? Although not technically the same thing we consider FPGA and CPLD devices to be in similar categories. Like FPGAs, Complex Programmable Logic Devices let you build hardware inside of a chip. And if you’ve got the knack for etching circuit boards you can now build your own CPLD development module. Long-time Hackaday readers will remember our own offering in this area. Our years of microcontroller experience have taught us a mantra: if it doesn’t work it’s a hardware problem. We have a knack for wasting hours trying to figure out why our code doesn’t work. The majority of the time it’s a hardware issue. And this is why you might not want to design your own dev tools when just starting out. But one thing this guide has going for it is incremental testing. After etching and inspecting the board, it is populated in stages. There is test code available for each stage that will help verify that the hardware is working as expected. The CPLD is programmed using that 10-pin header. If you don’t have a programmer you can build your own that uses a parallel port. Included on the board is an ATtiny2313 which is a nice touch as it can simulate all kinds of different hardware to test with your VHDL code. There is also a row of LEDs, a set of DIP switches, and a few breakout headers to boot. 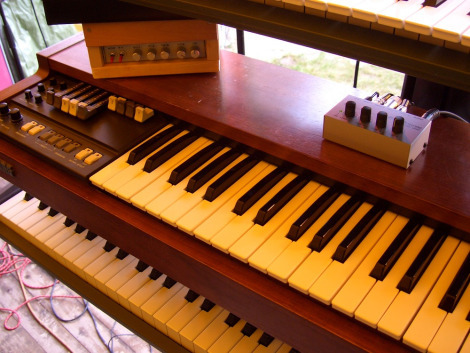 [Michael] loves this old organ of his, but recently he wondered if it would be possible to add MIDI out without altering its original functionality. With a bit of research and more than a bit of hard work he accomplished his goal. The nice thing about working on a quality piece of hardware like this is the resources you can find regarding how they work (which we bet is tailored for how to repair them when they break). [Michael] found a website with plenty of info on the circuit boards and how they work. From this he was able to locate a few chips which stream serial data regarding which keys have been pressed. Bingo! Once he located the three signals he was after he built a board to translate them to the MIDI protocol. His circuit is based around an ATtiny2313. It is supported by a liner voltage regulator circuit as well as a buffer chip which converts the incoming signals to the 5V levels needed. His home etched board is clean and well mounted, and the success of the project can be heard in the clip after the jump. This frequency meter project squeezes a lot of performance out of the ATtiny2313 microcontroller. That chip does all of the work, measuring the frequency on the input pin as well as multiplexing the set of 7 seven-segment displays which read out the measurement. The system is only as accurate as the clock crystal used by the AVR chip, so [Manekinen] recommends using one with the best tolerances available. It is also necessary to choose a value which is divisible by 1024 to get the best combination of accuracy and resolution. In this case he’s using a 22.1184 MHz crystal oscillator which is a slight overclocking of the chip which is spec’d to run at 20 MHz max. We didn’t totally follow his explanation of how the two timers are used for counting. But if we really wanted to drill down for a full understanding his code (written in BASCOM-AVR) is available. If you’re just interested in the hardware we embedded a screenshot of the schematic after the break. What can you do with ten buttons and ten lights? A lot. [Andrew] and [Nathan] found a collection of Hale Research keypads being thrown out, and decided to host the Keypad Contest. The goal of the contest was to create something nifty using the ten buttons and ten lights on the keypad, and an ATtiny2313 that replaced the original 8051-compatible microcontroller in the device. [Andrew] wanted to try making PCBs with his home-built CNC machine, so he milled out USBtinyISP programmers for the ATtiny2313. Then he gave out eleven development kits to a group, and explained how to develop on the hardware. After a month of hacking, seven people completed projects. The winner was an internet radio controller, which had the keypad sending serial data to a TP-Link WR703N router. The router used a USB sound card and OpenWRT firmware to stream music. The runner up was a timing game called “Capture”. The contest write up has details on all seven projects. [Andrew] and [Nathan] were successful in getting software engineers to try hardware with this contest, resulting in some neat hacks. After the break, check out a video demo of the internet radio controller. The spire used in this lamp is a part from an old television. It’s a glass delay line slide which pipes the light up from the Bluetooth controlled RGB lamp (translated) in the base. We have looked at delay lines previously when [Dave Jones] tore down a camcorder to get at one. But we must have missed the EEVblog follow-up episode which explains how the glass slides work. The device uses physical distance to form a delay. Waves directed into the edge of the glass slide bounce around at an angle before being sensed at the collection point. [Lukas] liked the visual appearance of the part and decided to use it to add visual interest to his lamp project. The nature of the glass makes it perfect for directing the light up and away from the PCB. The lamp consists of one RGB LED module controlled by an ATtiny2313 microcontroller. Also on board is a HC-05 Bluetooth module. This along with an app he wrote lets the user change lamp color and behavior wirelessly. You can see the lamp in action in the video after the break, but we think the camera shot probably doesn’t do it the justice it deserves. We’re very accustomed to seeing small media player builds, but [txyz]’s ATtiny-powered audio player is one of the smallest and most feature-packed we’ve seen. The audio player is powered by the very small and very inexpensive ATtiny2313. The music is stored on an SD card – a maximum of 2GB of WAV files recorded in mono at 32kBps at an 8-bit depth. On boot, the ATtiny loads the first audio file from the card and outputs it through a speaker connection. To make things interesting, [txyz] made the audio player controllable via a serial connection. Once a small FTDI adapter is connected to the player, [txyz] can connect to it through a terminal and run through his playlist. Even though the player is controllable through a serial port, there are a few pins left over that [txyz] could attach to buttons, if so desired. With a battery pack, this would turn his music player into the homebrew equivalent of an iPod shuffle. With the low component count, it might actually be cheaper than the shuffle, if [txyz]’s time is free, that is.